Who’s this handsome, manly, helmet-toting, badge-flashing, Segway riding, tucked-in-polo-wearer hunk? That would be no other than MKX® main writer Marcos Kirsch. 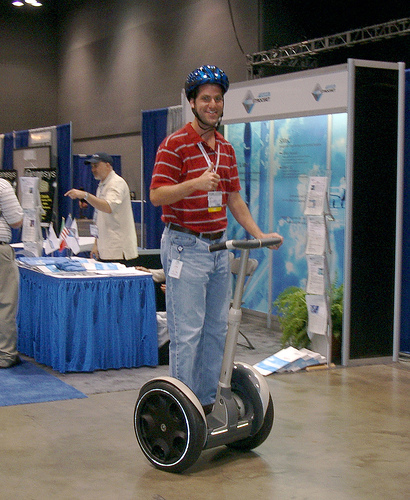 Today at the expo floor of NI Week 2006 I got a chance to take a Segway for a spin. I did not fall. It’s actually a lot of fun, especially with the added thrill of letting go of one handle and do the thumbs up long enough for Gustavo to take yet another blurry photo. Now, try to keep your clothes on, ladies. If you think the helmet makes me look good, you should see the napoleonesque jewfro conceiled underneath. 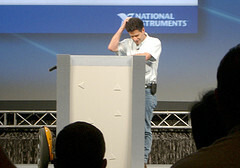 Oh yes, the inventor of the Segway, Dean Kamen himself happened to be there as well, delivering today’s keynote. He spoke about innovation, DEKA, and more importantly the FIRST initiative. Very interesting stuff.